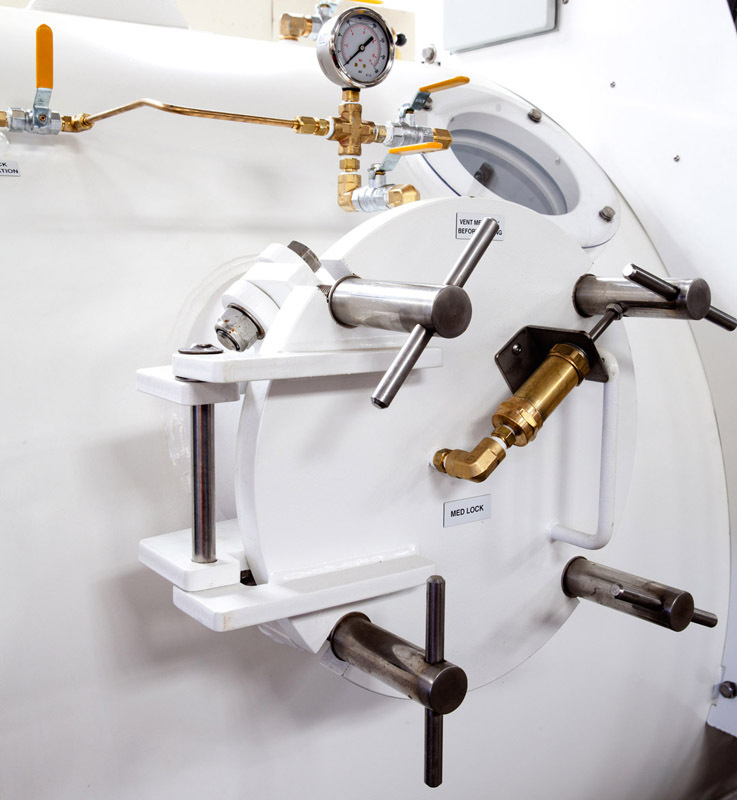 SMP are a leading manufacturer of hyperbaric chambers which are used to administer hyperbaric oxygen therapy or HBOT. 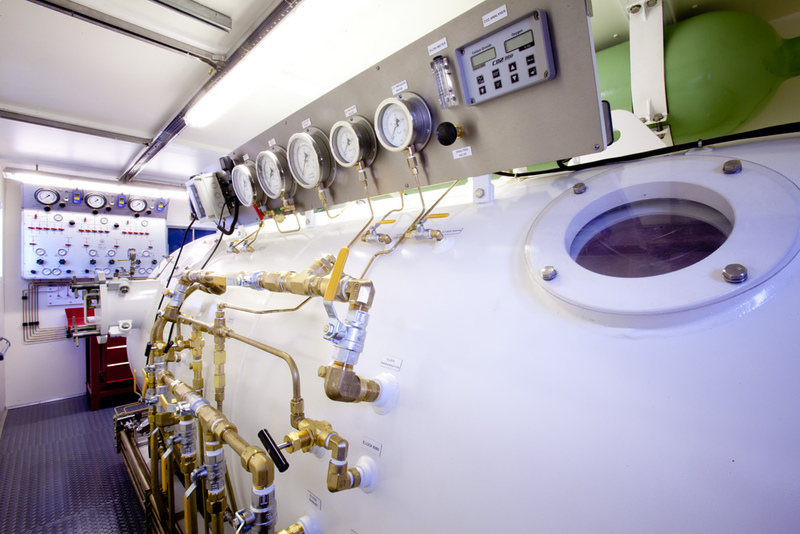 A traditional type of hyperbaric chamber is a hard shelled pressure vessel. As they are made of solid construction, they can withstand pressures in excess of 6 bars (87 psi). Hyperbaric chambers are mainly operated by diving organisations, Naval institutions, hospitals and medical treatment facilities. In addition commercial companies operate hyperbaric chambers offering paid treatments. One or more human entry hatches. Typically these doors are are circular although rectangular doors are used on larger chambers which are more accessible for emergency patients who need to be wheeled into the chamber. Airlock which allows human entry into the hyperbaric chamber. This is a seperate chamber with two hatches. One to the outside of the hyperbaric chamber and the othe to the main hyperbaric chamber. These allow the transfer of patients in and out of the main hyperbaric chamber without depressurising the main chamber that may still have patients inside. This is possible due to the fact they can be pressurised independantly. 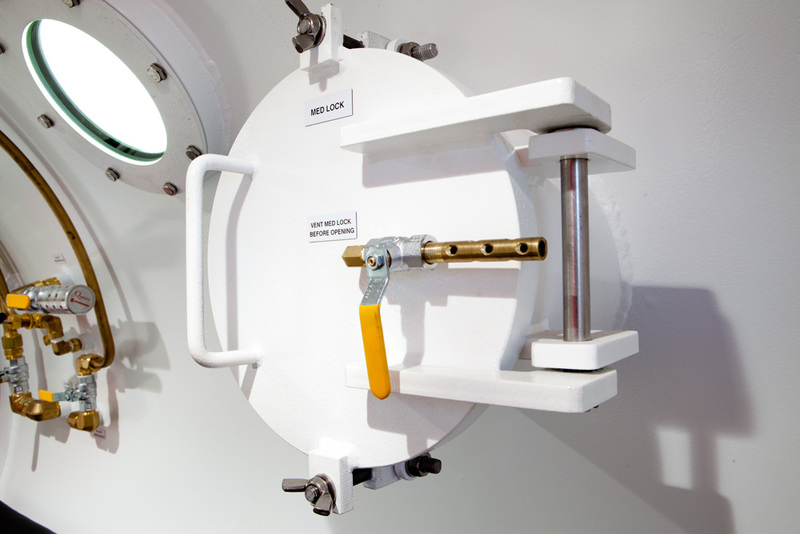 Medical lock which is a small airlock that allows the transfer of physical items in and out of the chamber without depressurising the main vessel. Usually used for the transfer of medicines, food and refreshments from outside the hyperbaric chamber to the patients inside the hyperbaric chamber. Viewing ports or closed circuit television in the form of a specially designed chamber video camera that allows technicians and medical staff outside the hyperbaric chamber to observe the patients inside the hyperbaric chamber. Intercom and chamber speakers are usually found in hyperbaric chambers to allow two way chamber communications between the technicians and medical staff outside the hyperbaric chamber and the patients inside the hyperbaric chamber. Carbon Dioxide (CO2) scrubber. As a hyperbaric chamber is a sealed pressure vessel, the air inside the chamber will quickly become poluted with CO2 that the patients inside the chamber exhale. This gas is poisonous and needs to be removed from the chamber atmosphere air to prevent the risk of danger to the patients. The scrubber achieves this through using a fan to draw in gas from the chamber atmosphere through a soda lime canister that filters the poisonous Carbon Dioxide out of the air. 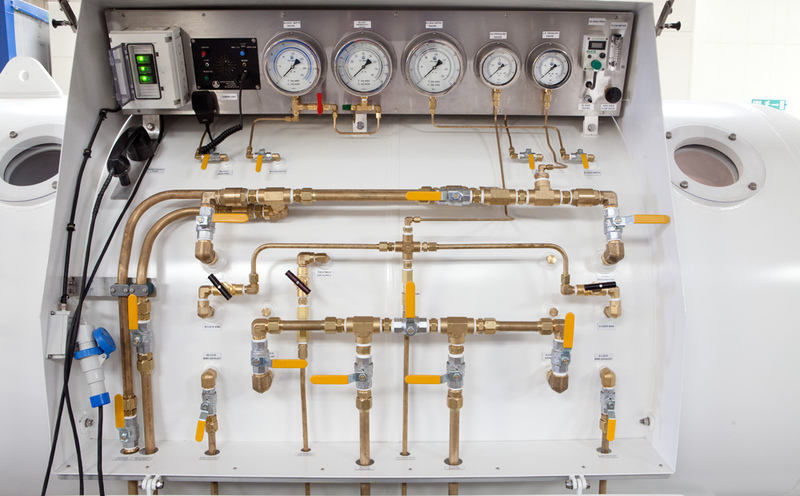 External hyperbaric chamber control panel that is operated by the chamber technicians to open and close valves that control air flow to and from the chamber, and regulate oxygen to BIBS masks or oxygen treatment hoods. In many of the larger capacity hyperbaric chambers, the patients and treatment staff inside the hyperbaric chamber will normally breathe 100% pure oxygen through either a face oxygen mask or an oxygen hood. Some oxygen masks are designed to take the exhaust gas that the patients breathe out outside the chamber. 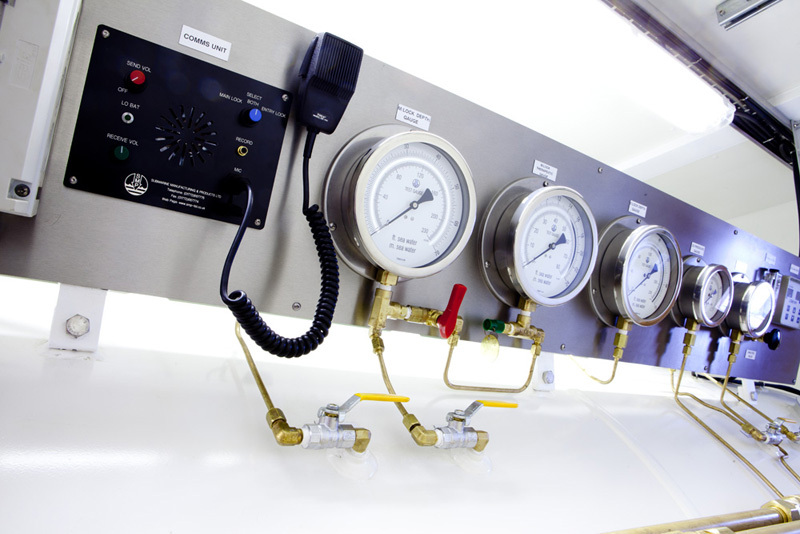 The oxygen masks are normally attached to an exhaust gas manifold inside the chamber that allows the exhaust gas to be extracted outside of the hyperbaric chamber. Throughout the hyperbaric treatment, patients inside the hyperbaric chamber breathe 100% pure oxygen in order to maximise the effectiveness of the hyperbaric treatment. They do have regular "air breaks" so as to minimise the risk of oxygen toxicity. Breathing pure oxygen for prolonged periods at elevated partial pressure can be poisonous to the human body and result in cell damage and death, with effects most often seen in the central nervous system, lungs and eyes. The exhaled gas must be removed from the chamber to prevent the build up of oxygen which can prevent a serious fire risk. Treatment staff inside the chamber will also breathe pure oxygen to reduce their risk of decompression sickness. 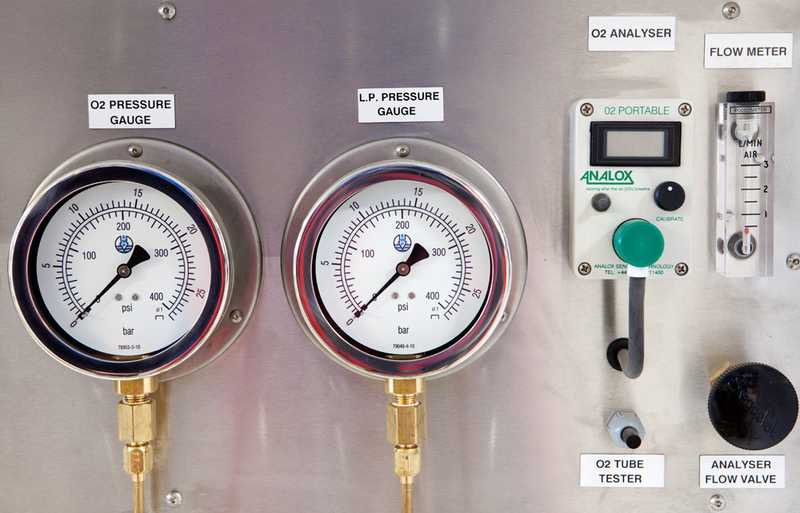 The hyperbaric chamber pressure is increased by opening valves allowing high pressure air to enter from storage cylinders, which are filled by an air compressor. 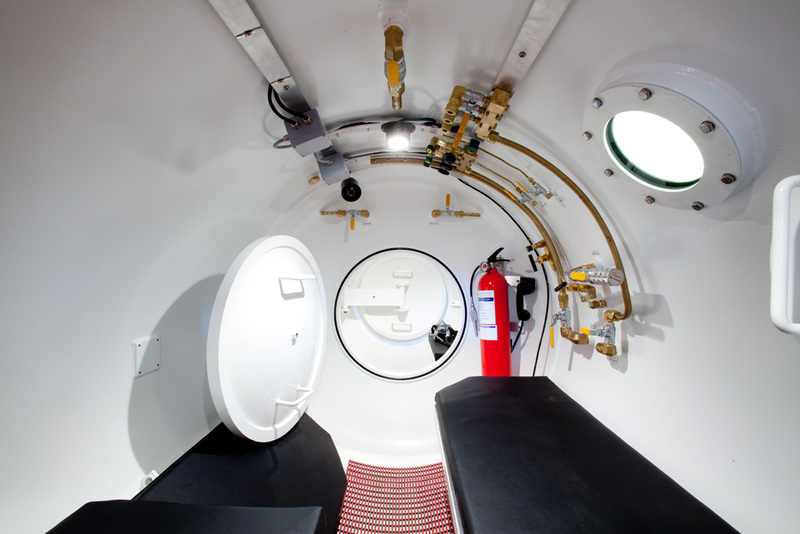 Hyperbaric oxygen therapy was originally developed for the treatment of diving accidents, involving bubbles of gas in the cell tissues, such as decompression sickness and gas embolism. Hyperbaric chambers are effective at treating conditions such as decompression sickness by increasing pressure, which in turn reduces the size of the gas bubbles and improved blood transportation to the body tissues. High concentrations of oxygen in the tissues help keep oxygen starved tissues alive whilst at the same time removing the nitrogen from the gas bubbles, making them smaller until it is made up entirely of oxygen. This oxygen is then in turn re-absorbed into the body. Once all of these gas bubbles have been eliminated, the pressure inside the hyperbaric chamber is reduced back to nomal atmospheric pressure levels. Emergency hyperbaric oxygen therapy for divers with decomression sickness, follows treatment schedules laid out in treatment tables. The majority of cases employ a recompression to 2.8 bars which equates to a depth pressure of 18 metres. Treatment lasts around 5 hours with the patient breathing pure oxygen. For serious cases resulting from high depth dives, hyperbaric chambers capable of pressures upto 8 bar or higher. The standard hyperbaric diving chambers that we manufacture are rated for pressures up to 10 bar which equates to a depth of 100 metres. The increased overall pressure is of therapeutic value when used for treating decompression sickness and gas air embolism caused as a direct result of diving incidents. Hyperbaric oxygen therapy is also beneficial in its ability to drastically increase partial pressure of oxygen in the cell tissues of the body. This is due to the fact that oxygen partial pressures achievable using hyperbaric oxygen therapy are significantly higher than when breathing pure oxygen at normal atmospheric pressure. A related effect is the increased oxygen carrying capacity of the blood. As the hemoglobin of the red blood cells are almost saturated with oxygen, oxygen transport by plasma is significantly increased. This is one of the main reasons that sports stars are using HBOT to aid injury recovery and increase levels of physical performance.